Cost: £25 if you bring your own easel and backing board, £30 if you need me to bring an easel for you. I shall provide drawing materials for everyone including paper, charcoal, chalk and graphite. You need to bring: Clothing suitable for the weather, farm-friendly footwear, your own picnic lunch, easel, bulldog clips (or similar) and A2 backing board if you have them. This session is set up much like a tutored human life-drawing session with artists working at easels around a posed model. In this case the model is a horse. 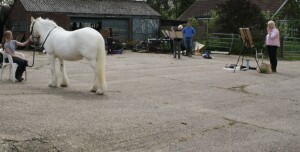 We hope to use Polo (the white horse shown above) again, as she is excellent at standing still and has very defined muscle structure. If weather is wet then we shall work in a covered barn. If conditions allow, we may have another chance to draw Lily posing on this horse. She is a trained equestrian vaulter and it was very exciting to be able to draw her balancing on Polo during our horse drawing day in May. This is a working farm with other animals including sheep, cattle and pigs as well as very attractive areas of land managed for wildlife. Artists will have the option of spending some time drawing elsewhere on the farm during the day. Places are limited, so please get in touch with me to reserve your space (Click on “Contact” at the top of the page). 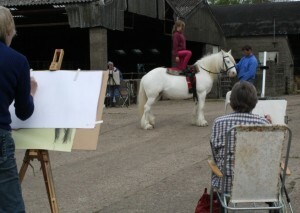 Are there any more horse life drawing workshops in the near future? Hello Marie, I intend to restart horse life drawing workshops next spring/summer as we do rely on the weather to some extent. 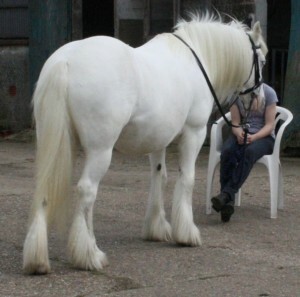 The will be details of further equestrian classes posted on this website once they are arranged. If you would like blog post articles, including workshop dates, to arrive in your email inbox, then you are very welcome to subscribe free of charge by adding your email to the box at the top of this page and clicking “Subscribe”.